Every once in a while, the younger child throws a curve ball by adoring a picture book that I wasn't sure would be a hit in the first place. Of course, I bring all sorts of picture books home still, even though both kids have moved on to chapter books that appeal to their unique interests. Why am I clinging on to picture books? Because I simply adore picture books - there is something magical about them; the kids think so too, and I hope they don't outgrow it anytime soon. Intellectually, I deconstructed the text of this book, read and re-read it for my own education, but wasn't sure how the kids will receive it. Right after the first read, the 6 year old said, "This is so silly. And funny! Can we read it again? Now?" The nine year old read it a couple of times and did her unique snort-giggle at the quirky funny parts. Little Sophie picks out a squash at the farmer's market. Her mom was planning to cook it for supper. But Sophie has other ideas. Thus starts this cleverly crafted book with a simple story of a friendship between a girl and a nondescript winter squash. Yes, that's right, a winter squash! If that doesn't automatically conjure up chuckle-worthy situations in one's mind, it's a pity. Her parents try their best to point out the obvious, but Sophie would not hear a word against Bernice, her squash. Wherever Sophie went, Bernice went with her. Every night, Sophie gave Bernice a bottle, a hug, and a kiss. “Well, we did hope she’d love her vegetables,” Sophie’s mother told her father. With clever dialogues to lighten the mood and convey the predicament of the parents, the book takes this friendship through its natural progression. And, before it gets too tedious, leaving the reader wondering how much longer to endure this nonsense, Sophie notices that Bernice is getting softer and is lacking her usual verve. 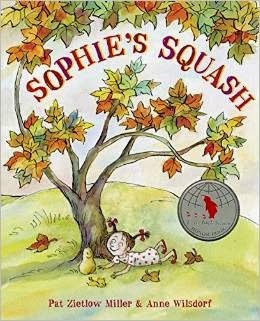 Resourceful and determined as she is, Sophie learns from her next visit to the farmer's market that "fresh air; good, clean dirt; and a little love" is all that is needed to keep squashes healthy. At home, Sophie cleared the leaves from Bernice’s favorite spot. She made a bed of soft soil, tucked Bernice in, and kissed her good night. "Get better soon," she whispered. And that is not the end of that. 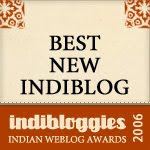 In fact, it is a new beginning. That night snow falls, and keeps falling all winter, burying Bernice. And, when Spring comes along there is a small green sprout in the spot where Bernice was resting all winter. Of course, by now, readers would recognize where this goes. Sophie tends to the now-sprouting Bernice all spring. One bright summer morning, Sophie somersaulted across her yard, landed by the garden, and stared in disbelief. It comes as no surprise when the book closes with Sophie cuddling Bonnie and Baxter, Bernice's kids. The illustrations capture and complement the tone and the humor of the story well. On the one hand, the adult mind might say, "Poor Sophie. How come she doesn't have any real friends? How pathetic! Why can't her parents do something constructive about it?" But, on the other hand, from the perspective of writing an off-the-wall picture book for children, this is so riotously inventive. Noticing that the 6 yo sees the silliness as well as the sweetness and the quirkiness in this whole situation, and reads it several times just for the fun of it, I'd say this book is definitely cherished. And soon, Sophie's Seeds, a sequel to Sophie's Squash is coming out. I can so relate to what you mean by clinging onto picture books. Bernice, Bonnie and Baxter - love the names! Winter squash seems like a perfect book for autumn. Off-the-wall picture books that carry quirky characters, while celebrating differences is something I can't get enough of. Love the uniqueness of it and so miss being able to pick it up from the public library free-of-cost!